UpFront with NGS: Don't Forget! NGS Family History Conference Starts in 1 Week! Don't Forget! NGS Family History Conference Starts in 1 Week! (4 May 2011) – The National Genealogical Society's (NGS) 33rd Family History Conference, Where the Past is Still Present, will be held on 11–14 May 2011 at the Charleston Area Convention Center, 5001 Coliseum Drive, North Charleston, SC 29418. If you have always wanted to research your family but don't know where to begin, the conference will feature a Family History Skills track for people new to genealogy or others who desire to broaden their research skills. This special twelve-lecture track will instruct you on how to research vital records, census, cemeteries, obituaries, city directories, printed genealogies, and county histories as well as how to organize your research and prepare a timeline. Full conference registration is available onsite with a discount for National Genealogical Society members. Single day registrations are also available. 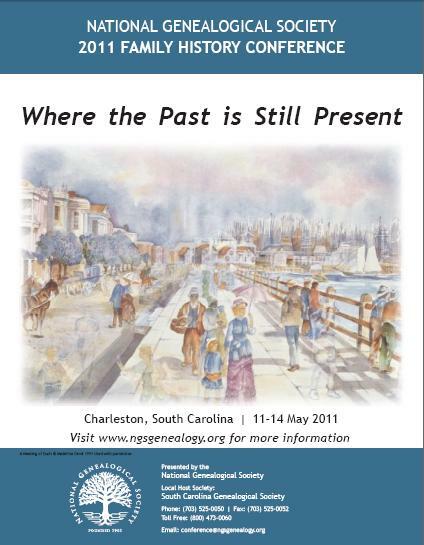 Program and registration details can be found at http://www.ngsgenealogy.org/cs/conference_info. If you don't have time to attend the full conference, a one-day session, "Genealogy 101," will be offered on Saturday, 14 May 2011, from 9:30 a.m. until 4:30 p.m. This hands-on workshop will review both printed and electronic sources for family history research and will cover essential record groups, how to determine an immigrant ancestor's origins, and how to uncover the facts behind those family stories. You can register onsite but space is limited so arrive early to secure a spot. An exhibit area with more than one hundred exhibitors will be open and free to the public Wednesday through Saturday, 11–14 May, and will include the latest in genealogical software, online research providers, and DNA testing services.